What is it about soup that makes it the perfect winter food? We’ve been eating so much of it lately and I’ve been having lots of fun playing around with different ones. I tend to use my slow cooker to make soups but I threw this one together on the stovetop one chilly evening recently. 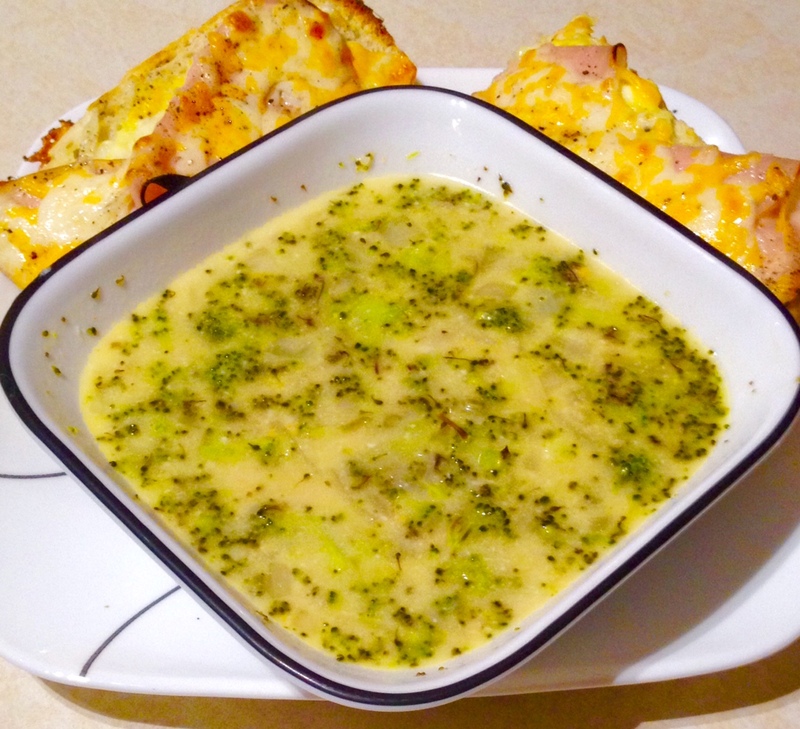 Roasting the broccoli gives great flavor and the roasted broccoli holds up well in the soup without getting soggy. Yogurt gives it a thicker, creamier base without as much fat as cream. I also put deli turkey and cheese on a baguette and toasted it in the oven to put alongside my soup. Because apparently there wasn’t already enough cheese in this meal for me. Preheat oven to 425 degrees. Line a baking sheet with parchment and put chopped broccoli on it. Drizzle with the oil and roast for 20 minutes or so, tossing once or twice throughout baking. While the broccoli bakes, put the butter, garlic and onion in a large pot over medium heat. Cook for a few minutes until veggies soften. Sprinkle the butter, onion and garlic with the flour and cook for a few minutes until the mixture is golden. Stir in the stock and water and bring to a boil, stirring to thicken. Turn back down to low and simmer until the broccoli is cooked. Stir the roasted broccoli, yogurt, cheese and hot sauce into the soup pot until fully mixed and cheese is melted. Taste and season with salt and pepper as desired (I didn’t need any salt). Serve!